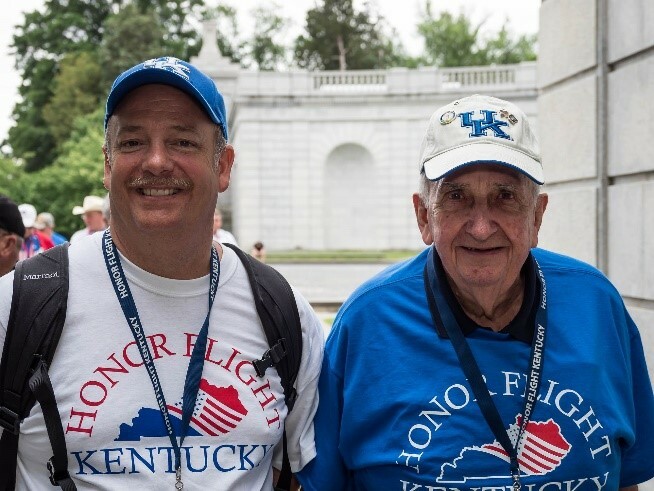 Honor Flight Kentucky Board member Evan Goldey became involved in the organization after serving as a guardian for his father-in-law on a 2016 flight. Upon his return, he was so impressed by the experience he immediately knew he needed to be involved in HFK in some capacity, initially signing up to serve as a volunteer guardian. As his participation increased, he had a desire to do even more and sought the involvement of his employer, Lexmark International, initially to assist with printing needs. This led to Lexmark proudly sponsoring the Homefront Heroes event, a special day focused on spouses of Veterans who participated in an all Vietnam flight in the fall of 2018.